Space officials in the United States and Europe are planning an ambitious dual-rover mission that could start collecting Martian soil samples in 2018 to be picked up by a subsequent mission and returned to Earth in the 2020s. The costly mission would blast off on an Atlas 5 rocket in 2018 and land two rovers on Mars with a single "sky crane" descent system that will be tested for the first time at the Red Planet in August 2012. It would be the first time two rovers will be delivered to the same landing site on Mars. 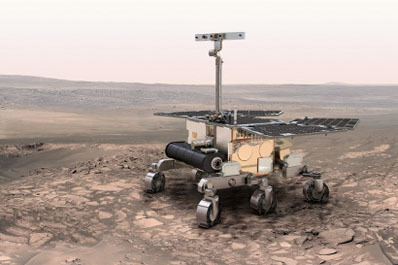 The European Space Agency's ExoMars rover and a $2 billion NASA Mars Astrobiology Explorer-Cacher mission are the leading candidates for the tandem project. ExoMars carries a drill to burrow into the Mars subsurface and retrieve samples from as deep as six feet underground. Some of that soil could be placed inside a high-tech storage device on NASA's rover for eventual return to Earth, according to Doug McCuistion, head of the agency's Mars exploration program. "There may be a possibility to actually cache subsurface samples that the ExoMars drill collects, which had not been in our plans before," McCuistion said in an interview last week. Marcello Coradini, ESA's coordinator for solar system missions, confirmed the studies of placing underground samples into a NASA cache for later retrieval. "We're hoping that what we do with our rover is actually collect the samples that we will then go back in the 2020s to retrieve in the Mars sample return campaign," McCuistion said. A simple sample cache was originally planned for NASA's Mars Science Laboratory launching next year, but officials removed the payload due to scientific and technical concerns, according to McCuistion. Spacecraft traveling from Earth to Mars can only launch about every 26 months, limiting sample return options. Scientists agree the best strategy is to spread the effort across three missions to spread the high cost of the endeavor among several years. "By breaking it up into those three pieces, you can sort of thread the costs and spread some of the risks over multiple missions and make the overall program both more robust and more affordable," said Steve Squyres, a Cornell University researcher leading an independent review of potential NASA science missions. Called the decadal survey, the review will rank the scientific value of 28 proposed missions for the next 10 years. The ultimate timing of a sample return campaign will boil down to the budget of both NASA and ESA, McCuistion said. David Southwood, ESA's director of science and robotic exploration, said kicking off a sample return campaign by 2020 "would mean going above the 200 million (euros) a year we're assuming as a steady-state (budget) in the late part of this decade." Squyres said the decadal survey will attempt to settle on an estimated total cost for three sample return missions. Recent cost projections have pegged the effort's total price at more than $5 billion. "(The sample return missions) could be spaced as close as close as three consecutive opportunities," McCuistion said. "We believe that budgets will probably require some distance between them. The Europeans will share some of those mission responsibilities with us, so we're thinking the gap between launches could be shrunk significantly." Planners haven't decided on a schedule for the sample's return to Earth, and it's possible the the precious soil could wait for up to six years -- or even longer -- before NASA and ESA can afford to send a mission to bring it back. One sample return option involves launching the caching mission in 2018, skipping a launch opportunity in 2020, then sending the an orbiter to Mars in 2022 that would ferry the cargo back to Earth, according to McCuistion. Another mission could fly in 2024 to fetch the samples from the 2018 landing site and launch the cache into orbit around Mars, where it would dock with the return orbiter and begin the journey home. But that's just one strategy. 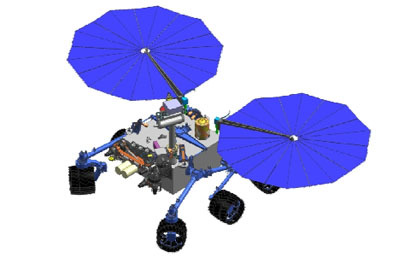 The results of the decadal survey report, which is due in March 2011, will also factor into NASA's decision on when to insert a Mars sample return campaign into its packed mission portfolio. "We still have a long way to go in design work, but the concepts that we're working right now look promising," McCuistion said. "It's going to rest mainly on budgets and what the decadal survey comes back and says." One competitor for scarce NASA planetary science funding in the 2020s is a $4.5 billion flagship mission to Jupiter, another joint undertaking between NASA and ESA. The Jupiter mission would include a pair of orbiters on two separate launches in 2020. The decadal survey's ranking of the Jupiter flagship mission and Mars sample return will likely decide which project launches first. "If the decadal survey comes back and says outer planets flagship needs to go first, and sample return goes second, that puts us in the early-to-mid-2020s, which is fine," McCuistion said. "If they say sample return needs to go first, I don't know what that would mean, but it's going to be difficult to accelerate it earlier than 2020 itself, with 2018 being the collection period." Squyres declined to discuss details of the decadal survey while the reviews are in progress. Although there is ample time to refine new technologies to enable a roundtrip flight to Mars, McCuistion said the chief technical hurdle facing engineers is launching a rocket from the Martian surface. "Launching rockets from Earth is one thing," McCuistion said. "Launching rockets from Mars is completely different." NASA has received technical proposals from engineering teams to begin conceptual design work on a Mars ascent vehicle. The agency expects to award study money to winning teams, McCuistion said. An ESA methane-sniffing orbiter and landing technology demonstrator have already been approved to launch on an Atlas 5 rocket in January 2016. 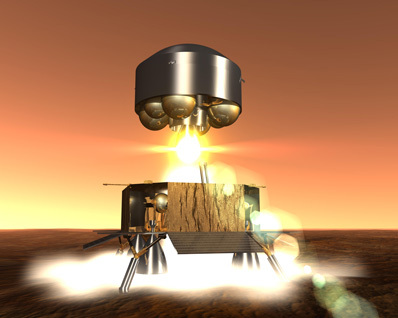 The Trace Gas Orbiter and Entry, Descent and Landing demonstration mission will be managed by ESA, but it will be the first project executed under the joint Mars exploration initiative between Europe and the United States. ESA's council of member states last December approved 850 million euros, or about $1.1 billion, for Europe's 2016 orbiter and landing demo, plus the ExoMars rover in 2018. All three probes are under a tight budget ceiling of 1 billion euros, or approximately $1.3 billion. ESA will request the rest of the funding in a few years, according to Southwood. "When we write the history, that decision taken by the council will be seen as the turning point," Southwood said in a July 8 interview. "That will be the point at which the Europeans said the future Mars program is together with the United States."